This is my seventh Marathon des Sables, and it took me three days to write this story. Three days of heat, sand, wind and miles of stony plateau. Three days of acclimatization, digestion really, of what the desert had in store. But also, three days of dealing with the consequences of a puzzling physical assault by a French journalist unable to resist the desert stress, and a funny (but true) story about him never finishing his ultras. My head remembers the hits. Hence the darker mood of the following text. Tomorrow is what we all call “the long stage.” It’s usually around 52-55 miles, but this year it’s exceptionally short: 47 miles. Why? Because the other stages are harder than usual. In the meantime, we’ve had what we experience each year: the longest travel to the heart of the Moroccan desert you can imagine. Going through customs in Ouarzazate is worse than going through customs in Kennedy Airport in the heat of European summer break. It’s hell on earth. 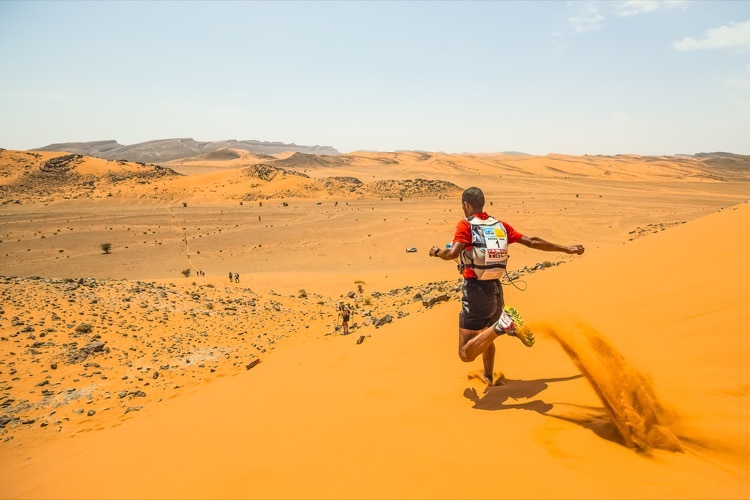 But understandably, for a small provincial town like Ouarzazate who barely sees tourists, having to deal with 700 impatient runners coming from all parts of the world is a messy revolution, to say the least. Then, the six-hour bus ride is both spectacular and boring. The scenery’s beauty outside a small bus window is hard to believe. One after another, the villages and small towns all look the same, and the locals all look surprised to see a horde of buses filled with foreigners. No matter how much you love yellow sand and green, oasis-looking palm trees and occasional black rocks, it all ends up looking the same. Hence the cruel boredom. During this bus ride, you also receive the important “roadbook.” It tells you what awaits you each day, how many kilometers you’ll have to run, what obstacles you’ll face, which bearing to follow and basically, how the Sahara will try to chew you up alive. Make no mistake: it is inhospitable. Destruction. Resistance. That’s what it’s all about. If you’re familiar with David Lean’s Lawrence of Arabia, this is it. You’re in the movie. Small dunes, bigger dunes, dunes as high as buildings, djebels (small mountains), oueds or wadi (dry stream beds), stone fields, small crevasses, villages, ruins, water wells, rather hostile tamarisk plants and hundreds of palm trees. There’s not much fauna in the desert to watch, or even play with. A friendly, stray dog here and there – one named Cactus followed the caravan of runners today for the entire 23 miles. Not many birds but some annoying flies, finger-length white ants and small, yellow scorpions that come out at night pretty much everywhere, including the campsite. The most memorable of it all was definitely the Merzouga Dunes, during Stage 2. They’re on the menu each year but this time was special. Usually, the Merzouga Dunes are kept as a grand finale: the very short last stage. But to spice things up and avoid the same course year after year, the organization decided to have us go through them for eight miles. In such dunes, even if the bearing we had to follow didn’t take us on top of the biggest, meanest sand dunes, we still had to face big yellow walls with wind blowing sand into our eyes, ears and mouths. It hurt. Everybody loved it and hated it at the same time. But more importantly, everybody got a little more tired, a little more sore and a little more sunburned. We like it that way. MDS is supposed to be hard. So far, race director Patrick Bauer has orchestrated it perfectly. After 34 years, he knows his desert. He knows how to inflict pain while showing us beauty. We keep going. We resist. The race will not destroy us. That is probably why people keep coming back. More on this later. Note: I want to take this opportunity to congratulate both Amy and Faris from tent 110, both leg amputees, both incredible athletes. It’s amazing to watch their struggle, their spirit, their drive. Those are the kind of heroes you meet in a race like MDS. Those are the humans who impact your life forever.